produced for the weekly Tottenham Green Market, Sundays through summer, 11-4pm. Gardening the Green – Every Wednesday afternoon: weekly work sessions, 2-4ish on Tottenham Green. All hands welcomed! 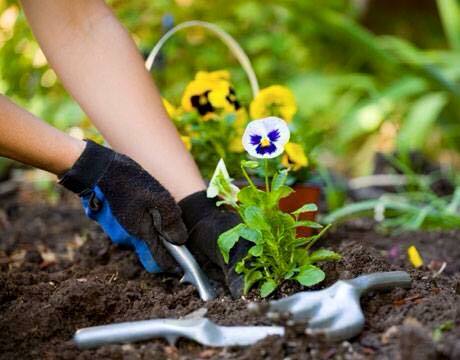 Hope to see you this evening, for some more gardening fun, from 6.30pm. And a huge thank you to everyone who joined us on saturday- the new garden at the old nursery is looking great! The big news is planting up a new community garden along the front of the Old Nursery on Tottenham Green, Sat 15 August, 11am onwards! Fri 14 August: Library Garden, 12 noon to 4pm: mainly a plant rescue exercise, in advance of the building work planned to shift in Council advice centre. Many of us are concerned not only about the halving of Library space, but also that the plans apparently intend to build a new entrance block right through the middle of the Children’s Reading Garden that volunteers have put a good deal of time and work into, and donated plants to — and which (except in winter) is much used as one of the rare safe spaces for local kids to run about freely, and to relate actual very hungry caterpillars, ladybirds, bees etc to their storybooks. Rescued plants will of course be re-homed…. **** Sat 15 August, 11 onwards, til 5pm or finished: Old Nursery Garden planting up day! If you have spare plants you could donate, could you let me know so that we can plan them into the design? All help greatly appreciated! Tues 18 August, 6.30-8: FOTG’s regular Evening on the Green: looking after, and admiring, our newly planted Old Nursery Garden… Plus (inevitably) a bit of litter picking. Tues 25 August, Lordship Rec Eco-Hub cafe, 1.00-3ish: ‘Green Gardeners’ monthly lunchtime sociable: relax, chat, swap plants, seeds and info… All welcome — for all green-minded gardeners across the borough. Hope to see you at one or more of these…. Green Tuesday this Week – PLUS: Green Signage Update! On the third Tuesday evening of each month, we’re getting out on the green with spades, clippers, trowels, and anything else that comes to hand, and spending time together, making the green a more pleasant place to stop and spend time*. This month, we’re excited to welcome Mark Smith and Neil Quin, who have been working hard on developing design ideas for improved signage and communication on the Green, so we’ll retreat to the Old Nursery (that’s the one overlooking the Green), to take a look at their plans, and give some feedback. So please join us from 6.30pm. We’ll meet on the green, next to the ‘Green Room’. We’ll start looking at the plans at around 7.30. 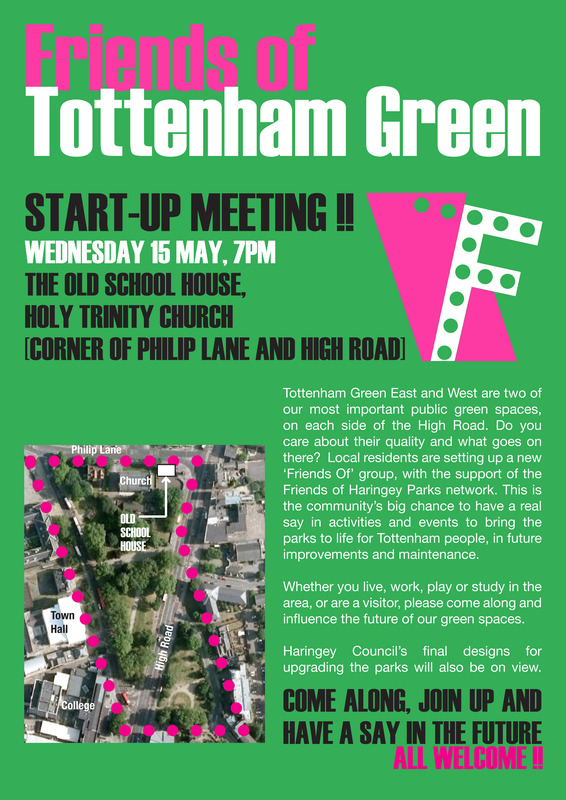 This evening (Tuesday 19th) the Friends of Tottenham Green will be Gardening on the Green, from 6.30pm. Please join us if you can! The plan is to meet every 3rd Tuesday of the month, to tidy up and incrementally improve the space. Followed by refreshments.. if you can easily bring any gardening tools, that would be great, too, but we’ll have some basic kit on hand. 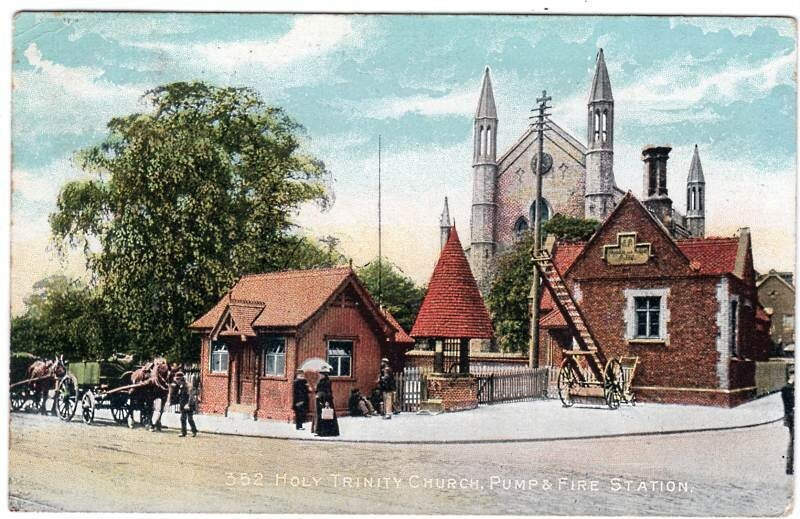 Holy Trinity Church fête is today 13th July from 11 am till late afternoon. There will be lots going on, including the Friends of Tottenham Green stall, to recruit more members – and there will be activities for kids of all ages.If anyone wants to come along and chat, give us ideas, sign up to the group or help run the stall for an hour or two, they will be welcomed with open and sunburned arms. Also, you can find out about our Bioblitz and other happenings in August, including the Church’s community week. Tottenham Green East and West are two of our most important public green spaces, on each side of the High Road. Do you care about their quality and what goes on there? Local people are setting up a new ‘Friends Of’ group, with the support of the Friends of Haringey Parks network. This is the community’s big chance to have a real say in activities and events to bring the parks to life for Tottenham people, and in future improvements and maintenance. Haringey Council’s final designs for upgrading the parks will also be on view.